Review: 2012-02-04, good fight ended by a nice submission (triangle armbar) in the first round: threes stars for Dustin Poirier vs Max Holloway (UFC Submission of the Night). Dustin Poirier, ranked as the No.15 featherweight in the world, entered the fight with a record of 11-1-0 while Max Holloway had a record of 4-0-0. 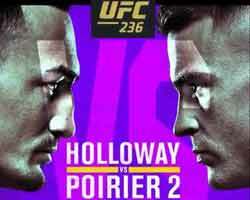 Poirier vs Holloway is on the undercard of Nick Diaz vs Carlos Condit (UFC 143). Watch the video!